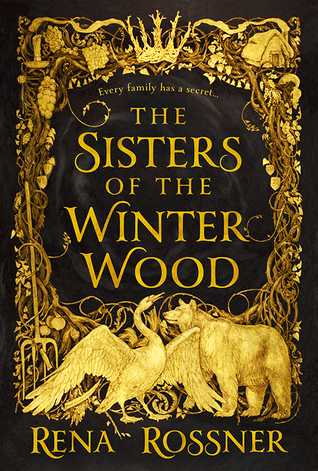 A literary fantasy written in the tradition of books like Uprooted and The Bear and the Nightingale, The Sisters of the Winter Wood is Rena Rossner’s debut which blends magic and history with folklore and stories from her own Jewish ancestry. A nineteenth century narrative poem called Goblin Market by Christina Rossetti also provides much of the inspiration for the novel’s premise which centers on a pair of sisters who are tempted by the fruit of goblin merchants, but it is also about so much more. Once upon a time, a swan and a bear fell in love. They married and had two daughters, sisters who are as different from each other as the sun is different from the moon. Liba is dark-haired, serious, and aloof, nothing like the younger Laya, who is blonde, beautiful, and prone to flights of fancy. Born into a Jewish family, the two of them live isolated from the town in the woods with their mother and father, who have kept the secret of their magical heritage from the girls. But as Liba and Laya begin to grow into womanhood, their parents are finally forced to reveal the truth: their Tati can transform into a bear, a gift which he has passed on to Liba, while Laya has inherited the power to turn into a swan, taking after their Mami. However, soon after imparting these earth-shattering revelations, their parents are called away to attend an ailing family member on their deathbed, leaving their daughters with instructions to be careful and to look after themselves and each other while they’re gone. Much to Liba’s dismay though, Laya reacts to this newfound freedom from parental guidance with her usual reckless abandon. The younger girl immediately becomes besotted with one of the shady Hovlin brothers who have recently arrived in town to sell fruit at the market. Meanwhile, other strange things are putting the townsfolk on edge, like rumors of a rogue bear in the woods, people are going missing, and then two horribly mutilated bodies are found near an orchard. Amidst rising anti-Semitic attitudes and fears that her sister is being tempted down a dangerous path, Liba grapples with her own feelings for a young man who claims to be in love with her, as well as the changes to her body brought on by her ursine heritage. The Sisters of the Winter Wood is gorgeously written, if a little over-embellished at times. For example, Laya’s chapters, which alternate between Liba’s, are completely written in verse-form. It’s a stylistic decision that didn’t do much for me personally, though it did help differentiate the contrasts in the sisters’ narrative voices. The prose also has a tendency towards melodrama, using awkward expressions in an attempt to sound more lyrical but more often than not they would merely stick out like a sore thumb. Because of the magical and evocative tone of the novel, however, I would say the writing style effectively adds to the haunting, beguiling atmosphere and the fairy tale undertones the author was obviously trying for. And of course, as with most fairy tales, there are a lot of familiar motifs and tropes at play here, but I was also impressed how Rossner managed to inject a bit of novelty into the story. Plus, by using the familiarity to her advantage, she allows readers to tease out deeper meanings in the areas she has designed to stand out. At the end of the day, stories like these are about the enduring themes anyway—timeless concepts and values like family, devotion, and unconditional love. Needless to say, the bonds of sisterhood play a significant role, and so too does the characters’ Jewish heritage and how that has affected the way their family is treated. This latter subject has a distinct feel of being more personal and emotional to the author, and she gives some insight as to why in her afterword which includes a brief history of her forebears’ escape from the anti-Semitic pogroms of Europe and later the Nazis. There are elements of her family’s story in the setting of this book, creating a mood of high tension and foreboding. Its especially noticeable in Liba’s chapters, hers being the more anxious voice as she worries for her sister and frets over the darkness spreading through her town. That said, this book is probably not for everyone. It’s a rather quiet, slow-moving tale, less plot-driven and more concerned with developing the characters and their relationships. However, fans of stories inspired by fairy tales or grounded in folklore will probably like it, especially if you have also enjoyed the genre’s recent offerings from authors like Naomi Novik and Katherine Arden. At the same time, The Sisters of the Winter Wood isn’t bringing us anything too new when it comes to books in this vein. Like most trends, I think fatigue is starting to set in, which probably explains why I’m not feeling as excited and enchanted by this novel as I wanted to be. Still, I enjoyed it a lot, and it’s absolutely worth taking a look if the description of the book’s story and style appeals to you. Thanks for this review. I’m torn now, I loved Uprooted and Spinning Silver and I enjoyed the Bear and the Nightingale but the idea of chapters read in verse… I’m not sure I could cope with that. Haha, yeah. The popularity of these types of books have exploded in recent years, but McKillip was doing it ages ago. I tend to do well with character driven books so that is helping to convince me too pick this up. That being said, the verse thing may not work for me so it will definitely have to be a library grab. You get used to the format after a while. It’s presented in verse, but not like poetry or anything. It was just mildly irritating and felt a little gimmicky to me. I think it would be a great library book though, if you’re not sure if you’ll like it! I was really surprised when I flipped through the book and saw the verse chapters. I’m not sure how that will work for me, we’ll see! I didn’t really like the verse chapters but at the same time I didn’t find them difficult to read, I just read it all as normal text tbh – I didn’t really see the point of that style choice other than like you say, to distinguish the two voices. And, yes, I think I’m also getting a little tired now of the fairytale retellings. They seem to be suddenly very popular. Yeah, after a while I got used to the verse chapters too, because like you said, it just sounded like normal text! I didn’t know what the point of the verse was, really, lol. And agreed, I think we’re approaching full capacity with these types of books. Ooh, I was intrigued until you mentioned the verse part… not a thing I’ve ever really managed to enjoy. I’m still excited for this one. The verse thing is interesting. I think I’ll either love that aspect or it will really annoy me lol. Great review! Ah, that’s a good point! I do like audio so that may be a better fit then. Huh, that is strange. What is the point then? Experimental writing? Hmm. I’m a bit on the fence about this one. I can be a bit hit or miss with fairytale/folklore stories. Yeah, I’m the same way now with these types of books. Such a pretty cover and a great review! Oh yes, the cover is stunning! And thanks! Aw man, would’ve been nice if it did bring some kind of novelty, but I do like the premise for it. The issues you raise are however totally understandable! Awesome review as always!